If you have been involved in leather tooling for any length of time, you hear people talk about “Flow.” Many of us understand the premise behind the flow of leather floral designs, and many times we think we know what that means. But for some of us, we simply do not truly understand the concept of flow. This article is a summary of the concept of “Flow” from our eBook “Introduction to Leather Floral Design” that I wrote in 2017. For me “Flow” has always meant simply that whatever I draw within a pattern it should have the sense of movement and seem to be going somewhere and coming from some place. This seems simple enough right? When we are laying out a pattern within the boundaries of the item or the tooling window, we have to take into consideration first where we are going and second where we are coming from. These are the first two questions that I ask myself when I begin my layout. Once we have a piece laid out in front of us and have determined the answers to these two questions, now we can determine the steps that we have to take to maintain the flow of the pattern. The flow of leather floral designs is not something that can be miscalculated because you chose the wrong direction. In floral layout, left to right or right to left is independent of flow. This means that we can have flow within the pattern no matter if one direction looks better than the other. The flow of a pattern is set by deciding on a direction and taking the viewer on that journey without interruptions. Once the direction is decided, then the pattern layout is now bound by those directional choices as we begin layout. Decisions must be made according to the direction we have chosen. I see flow as my ability, as the viewer, to hop onto any point within a pattern with my eye and follow the pattern all the way through the piece. If I hit a spot within the pattern that dead ends and I am left with no place to go, then the flow has ended. There are times when this is appropriate but for now let’s just agree that we would rather not see this. Leather stamping tools can be somewhat overwhelming when you look at all the different brands, styles and types that are available from all the different producers. Then you try to figure out which tools you actually need versus the ones that are just nice to have. There seems to be an infinite amount of choices in the “nice to have” category. While there are many stamping tools that fall into the “nice to have” category, Undercuts are not one of these. In my opinion, undercuts belong in the “must have” category for any tool collection. I have seen many collections where the maker simply made his own version of undercuts but the fact is that he had a set. Much like a beveler, the undercut is one of those tools that can make your job smooth or the lack of them can hinder your tooling progression. In this video I quickly show you how I go about sharpening my swivel knives. A sharp swivel knife is key to a successful tooling session and is more times than not the reason for poor results. I also take a minute and show you the difference between cuts made in leather with a dull or rounded knife blade compared to a sharpened blade. If you are wanting to insure that your tooling sessions go as smoothly as possible, check out this video and see if it helps you to get a good edge on your blades. *I apologize for the audio quality in this video… I am not sure what happened to it. In this video I show how to make a pancake knife scabbard. These scabbards are very popular and easy to make. They are a great project whether you are new to leatherwork or a seasoned maker. The scabbards that I am making in this video are patterned for a double blade trapper knife set at a forward tilt for a more comfortable fit and ease of taking the knife out. In the video I walk you through my entire process from cutting them out to finishing the edges. If you are wanting to make a few simple items that sell well to your customers, or want to make some gifts for christmas this is the item I suggest. If you enjoy the video and would like to purchase the companion pattern pack for the video you can purchase it HERE. The pattern pack is an INSTANT DOWNLOAD PDF that includes the cut patterns for both the front and back including stitch lines as well as 8 different tooling patterns to get you started. The versatility of these scabbards are endless. You can buckstitch them instead of sewing them, you can make them rough out for a more rugged look, you can make them simple by using scrap latigo, or make them as ornate as you would like with tooling, painting, and maybe bling (if your into that). Thanks so much and I hope you find the video helpful. 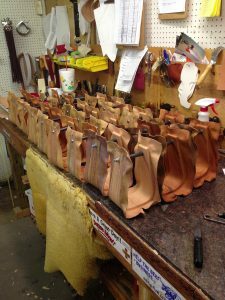 For many of us in the saddle making or leatherworking industry, we are a shop of one or maybe two people. This business model has both its advantages and difficulties. 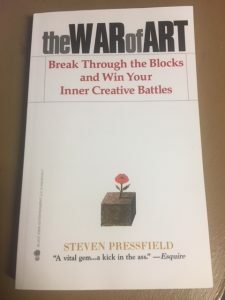 Finding time to design the products, build the products and market the products all while keeping a handle on the administrative aspects of our business make for a challenging day to day. While most of us can not afford to hire a full time office manager or marketing manager, we can use the wonderful technology that is right at our fingertips and virtually free when compared to adding staff. In this article, I will show you the 7 essentials for a one man workshop in my opinion. There are definitely more apps, tools, and systems that can be put into place to help you accomplish your business goals, but this short list is what I would call the minimum to help you minimize the work involved in running a one man show. The first in our list is the smart phone. Whether you carry an iphone or Android, the majority of the population to date is carrying some sort of phone with internet capabilities. This little device, although sometimes very intrusive and time consuming, can be your best asset to help you run your small business. At first glance, the infinite availability of apps for these phones is astonishing to say the least. You can download apps to give you access to all your marketing and social media channels so that you can monitor and update on the go. You can get apps to edit photos and even your website straight from your phone without having to sit down at a computer. You can access all your email addresses and contacts from this device. Outside of being completely available and connected to your customers all day everyday (which can be hard on productivity at time), the camera available on these devices has brought a quality to our workshop photos that before was limited to only those who dabbled in photography along with their craft. The ability to capture quality photos of your works in progress, completed works, and videos of work being done has opened our shops up to both interested consumers as well as fellow craftsmen through social media and these devices. In my opinion the smartphone is one of the most essential tools for any one man craftsman looking to grow his/her business. Never before have we had so much marketing power and access to our customers wrapped up in a device small enough to fit in your pocket.